I first started to dream about sailing away on a small boat when I was in my teens and I read about the wonderful exploits of Francis Chichester, Bernard Moitessier, ...Sadly nothing came of it until I was in my early forties. Along with a partner, I bought a boat to go cruising in and we started preparing for a new lifestyle. Things didn't really work out as planned and about 10 years later I found and bought Speedwell and decided to venture forth on my own. I was born and grew up in and around Cape Town, South Africa. Managed to scrape a degree in Mathematics at UCT and after an abortive attempt at teaching got involved in computer systems development. After a few years of working for IBM I decided to freelance and enjoyed the freedom that this gave me. I was married for about 5 years and have a son, Peter Louw who now lives in England and is married to Sarah. They have two daughters, Kayla and Amy which makes me a granny. 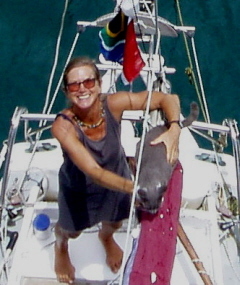 Before leaving Cape Town on Speedwell, my solo sailing experience was minimal. 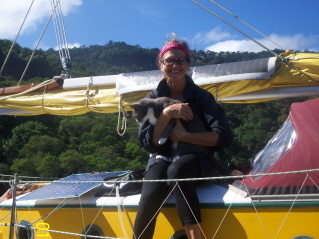 I had done some blue water cruising: in 1994 I crossed the Pacific with Gerry Noel on his yacht Rajah Laut, travelling from Panama to Tahiti via the Galapagos, Marquesas and Tuamotos Islands. Other than that, it was just day sailing around Cape Town and up the West Coast. Not a very hospitable sailing area. Apart from computers, my main interest before I started sailing was gliding and for 10 years I owned and flew an ASW19 which was just the most fantastic thing. I still rather miss the flying. I also spent a few years paragliding after having sold my glider, and thought of carrying the paraglider with me on Speedwell, but as things have turned out there have been very few opportunities to fly and it would have probably just mouldered away in the forepeak taking up too much space. After having seen many dreams to go cruising founder due to too much concern over achieving the ultimate in equipment and gadgetry, I prefer to keep things as simple as possible. Even so I spend a lot of time maintaining and repairing the equipment that I do have. Protecting electronics against corrosion becomes an obsession after having to replace laptops, digital cameras, invertors on a sickeningly regular basis. I have no refrigeration on board which has not really been a problem. It certainly heightens my appreciation of a really cold beer when I do manage to get one. Consequently the energy requirements on board are very conservative. Fitting an LED tricolour/anchor light was a great improvement and I can almost cope with solar panels alone. If there is not enough sun then I run the engine to keep the battery topped up. I fitted two 6 volt golf cart batteries when I was in the US and they have lasted very well. 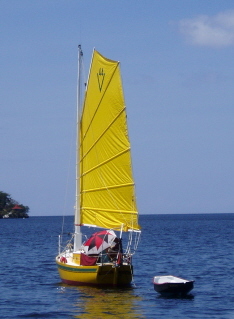 I enjoy the independence that sailing on my own gives me. The ability to choose where and when I want to go (weather permitting of course), where and when I want to eat, etc. is a wonderful luxury. This may make more sense to other women as most men take these things for granted anyway. Naturally there are times when it would be nice if there was someone else to fix whatever has just broken, or help with keeping watch, but it is a very satisfying feeling when you arrive at a safe anchorage after what may have been a difficult passage and you have done it on your own. I never get a chance to feel lonely as other cruising people are always very friendly despite occasional language challenges. At sea only having Sinbad for company doesn't bother me at all. It really just boils down to the fact that I'd rather be cruising on my own than still just be dreaming about it.